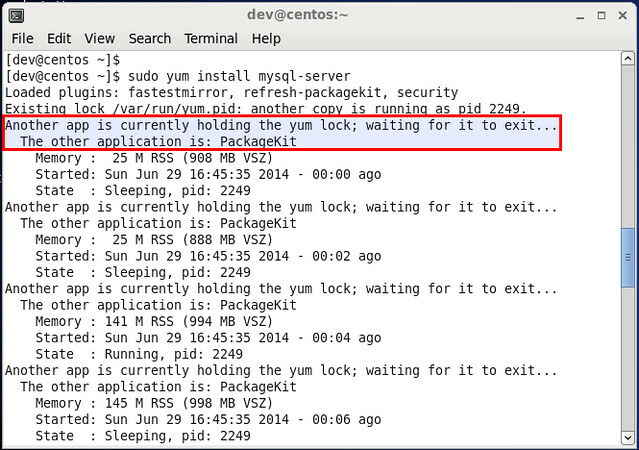 Question: When I tried to install a package with yum command on [CentOS, Fedora or RHEL], I got the error saying that "Another app is currently holding the yum lock; waiting for it to exit... The other application is: PackageKit". PackageKit seems starting automatically in the background, interfering with yum command. How can I disable PackageKit to avoid this yum error? PackageKit is a suite of programs designed for checking, updating, and (un)installing packages on a Linux system. When PackageKit is running in the background, it blocks any other software management initiated by users (e.g., with yum command). When you fail to run yum command due to PackageKit holding the yum lock, you can simply wait for PackageKit to finish, and then run yum command again. However, if PackageKit is really annoying to you, you can disable PackageKit. Here is how to turn off PackageKit on RedHat-based system. One way to get around PackageKit during yum operation is to use "--disableplugin" option with yum command. This will temporarily disable PackageKit, and thus you can proceed without being interferred with by PackageKit. If you want to turn off PackageKit permanently, you can do the following. This will disable PackageKit permanently on the next boot. Open /etc/yum/pluginconf.d/refresh-packagekit.conf with a text editor, and change "enabled=1" to "enabled=0". A final approach is to simply remove PackageKit altogether. On a fresh CentOS 7 install I had to previously disable SELinux in order to be able to disable PackageKit, HTH. Seems that "systemctl disable packagekit" doesn't really work. Upon reboot, the daemon is still running. I find that packagekitd is still running after reboot too. I've found updates have already broke my virtual box appliance I spent days creating. Fixed it, but I could do without the pain.